Amidst the turmoil in Egypt, the fracas in Wisconsin, and the constant budget battle in Washington DC, the ballad of Bruce Sherbet continues on in Dallas County. Who is Bruce Sherbet and why should you care? Until four weeks ago, and for twenty four years prior, Bruce Sherbet was the Elections Administrator for Dallas County. Democrats, Republicans, Tea Party, and independent voters with no party affiliation regarded Sherbet as fair, impartial and, most importantly, professional in carrying out his duties to the citizens. As Elections Administrator, it was Sherbet’s job to ensure that all elections in Dallas County were fair and impartial by ensuring that all election procedures were carried out in accordance with local requirements. 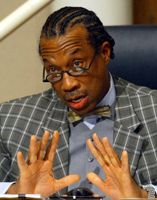 Approximately one month ago, Dallas County Commissioner John Wiley Price decided that a change was in order. Price convinced Dallas County Judge Clay Jenkins to call a meeting of the Dallas County Election Commission, which hadn’t convened once in the nearly two and a half decades of Sherbet’s tenure. The sole purpose of the Elections Commission is to hire and fire the County Elections Administrator. Prior to the meeting, Price informed Sherbet that he would get him out, "one way or the other." Faced with the prospect of termination after nearly a quarter of a century of service, Sherbet tendered his forced resignation. The interim Elections Administrator that has been appointed, and will likely be confirmed as the next Elections Administrator, is a long time, personal friend of Price who has been handpicked by him for the job. Due to personal and professional connections with Price, impartial elections are in peril of becoming a distant memory in Dallas County. It is not only Conservatives who are concerned. The Dallas County Democratic Party Chair spoke out publicly against Sherbet’s ousting and many rank-and-file Democrats have joined in the fight. Sherbet’s forced resignation is just one casualty as Price wrangles for the complete control of Dallas County, even if it comes at the expense of professionals, like Sherbet, who have faithfully and selflessly served the people of Dallas. As problematic as all of this is, Sherbet’s forced resignation is not even the most pressing concern of Dallas County citizens today. Seventeen Dallas County citizens attended Commissioners Court on Tuesday to express their concerns about the closed door deals surrounding the forced resignation of Sherbet, including TexasGOPVote blogger Adryana Boyne. One by one, nearly all of these speakers were interrupted, and many were shut down entirely, by the furious pounding of the gavel. Rather than listen to the voices of the electorate, Jenkins decided to pull a "Murbarak.” He shushed the speakers citing rules which are supposed to be for public servants (like him and Price), but applied in this instance to those pesky taxpayers and voters. One speaker lamented “If we can’t tell you our concerns in this forum, then where can we do it?” That comment, too, was shut down by Jenkins’ relentless gavel. Probably the most upsetting was Jenkins’ interruption of a bible verse that was being read by a local pastor. According to Jenkins, that too was out of order. 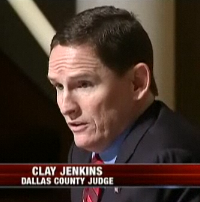 Jenkins is claiming that any criticism of any County Commissioner, County Judge, or the Commissioners Court as a whole is a violation of the Dallas County Code of Conduct for speakers. Jenkins’ gavel pounded the lectern in a manner reminiscent of the thug's clubs in Cairo that evening. But like most who wish to silence opposition, it was not in defense of justice, but in support of those who wish to control and eliminate all opposition in the County. In theory, the revised Code of Conduct would prevent outbursts like these from Price in the future, but history has shown that Jenkins, the presiding officer of the Court, has neither the courage nor the desire to stand up to his Democrat compatriot. And a Code of Conduct that robs citizens of their right to voice their concerns to their elected officials in a public forum has no place in government. Weren't we just celebrating Reverend Martin Luther King, Jr. a few weeks ago and his legacy for a color blind society? Price must not have gotten the memo. Incidentally, Price’s racist outburst was precipitated by a member of the public’s address. The speaker called Price “Chief Mullah.” Price says he heard “Moolah” which he claims is a derivative of an Italian racist term. While I do not condone calling an elected official names, racist or not, I hold my elected officials to a higher standard and am appalled by Price’s behavior. Price spewed his insults to our speakers last week, while Jenkins leaned back and laughed. Jenkins blamed his behavior on painkillers that he is taking for a broken leg. While we feel for Jenkins’ misfortune, it is troubling that an elected official is presiding over and voting on County business while “high“ on painkillers. And the unprofessionalism continues. We in Dallas County need help. We need to keep the heat on Price and the lack of a suitable, non-partisan candidate for the post of Elections Administrator. Phone calls, letters and emails are needed now from those who wish to make their views known. Most of all, we need to continue attending Commissioners Court and demanding that they listen to the voters. Starting last Tuesday and from this point forward, any comments about the performance or activities of individual Commissioners, the County Judge, or the Commissioners Court as a whole will now fall under the umbrella of “personal attacks” on members of the Court and will not be tolerated. Using Jenkins as the puppet that he has proved himself to be, Price is attempting to all but shut down any recourse from the public. As is the case with most dictators in history, this is often where their rule, not governing, begins. We can go home and recall past good times or we can continue the fight. I suggest that current events remind us that we are on the side of justice and the clock is ticking for those who wish to rule, rather than serve. What about free speech? What about our First Amendment rights? What about the fact that we have now lost our only forum available to publicly address the elected officials who sit on our Commissioners Court? How did we get to this point in the first place? Dallas County has become the next Chicago or Detroit and John Wiley Price is our new political boss. Citizens and the media know that Price runs the county and will stop at nothing in his quest to control elections and to collect the graft that he figures he has coming to him. In one final act of disrespect on Tuesday, Price, the man who started this firestorm in the first place, ridiculed the speakers who were shut down in Commissioners Court yesterday with a big grin on his face, telling the media “Y’all wanted a Code of Conduct. You got a Code of Conduct.” What now? We are in our fourth week of protesting and picketing the Commissioners Court and Jenkins and Price have now shut down our only outlet to express our valid concerns. Dallas County Commissioner Maurine Dickey, the only Commissioner who has taken a stand for what is right on this issue, is alone in all of this. Where is our party leadership? Where is the Attorney General? Is anyone out there listening? iCecile Newberry-Fernandez is a conservative political consultant, fundraiser, activist, and speaker. She lives in Dallas with her husband, Lawrence Fernandez. 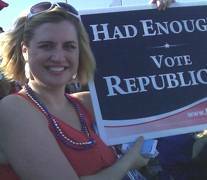 Additionally, Cecile Newberry-Fernandez is involved in: Dallas County Precinct Chair -Vice Chair; Dallas County Young Republicans -Member; Dallas Chapter of the Republican National Hispanic Assembly -Board Member; Project Matthew -Board Member; Dallas County Historical Society.